For a preview of this kit, see here. Detail on most parts is very nicely done. As this kit dates from the pre-3D-printing era, I assume the master was done by hand, and this shows in a few places, like the roadwheels, where some of the detail is somewhat uneven. 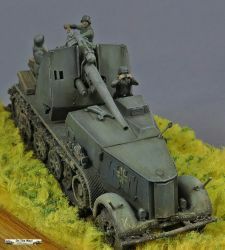 Like with all resin kits, some flash is present, and this will require a substantial amount of work to remove in delicate places like the tracks and previously mentioned roadwheels. Fortunately, the resin is soft and not brittle, easing the task at hand. Nevertheless, a small amount of clogged mud on the suspension would not be a bad idea. (Not too much, or it would cover the otherwise convincing detail.) The underside of the fenders is rather rough as well, and while not really visible, the same trick will help here as well. Before I continue my assessment of the assembly of this kit, I need to point out that I soon ran into a rather annoying problem. Whenever I primed the kit with my usual automotive primer, the primer became sticky after a few days. Luckily this a resin kit, which means that the primer can be removed (e.g. with acetone) without any risk of damaging the parts, but after a few tries I threw in the towel and put the kit aside. I reasoned that some of the chemicals inside the resin had not completely evaporated and that time would take care of that. What I didn't foresee (even if I could have) is that it would eventually be five years before I rediscovered the kit, languishing at the back of a shelf, behind and underneath other shelf queens. As the third law of shelf queens states that a kit that is set aside loses about one part per 8.4 months (on average), some other nasty surprises were awaiting me. But, the resin apparently had cured and after removing the primer one last time, I was able to paint the kit. It might have helped that by this time I had switched to acrylics that were applied directly to the resin (without primer). So, construction started, again. Some parts had to be disassembled as this made removing the primer easier, and built up again. 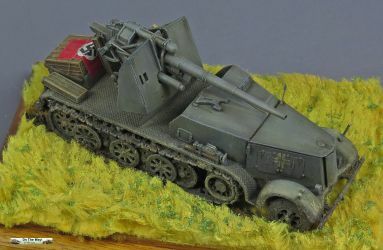 Note that I don't have reliable plans or measurements yet, but I hope that Panzer Tracts will one day follow up on their current series of books on German halftracks with one on the Sd.Kfz.8. When installing the tracks, one needs to be very careful to place the end of those track halves that lack track teeth around the sprocket, not the idler. I also found that installing the tracks before adding the outer roadwheels (and sprocket ring) to be much easier than afterwards. I also decided to remove the small pegs on the back of the sprocket rings, as this made installation less stressful. Nevertheless, I discovered that both tracks were one link short. GB Modelli sent me a replacement set, however, which became a source for the missing links. Note that period pictures show a wide variety of tyre patterns for the front wheels, and the ones in the kit don't look out of place. After finishing the tracks, I moved to the hull. The fit of the upper and lower hull was perfect, which is no mean feat for resin pieces of this size. The top plate of the engine compartment had some air bubbles that needed filling and while there are some other air bubbles in the kit, almost all are in places that are invisible after construction. A figure was put into the driver's compartment. I combined a Wee Friends torso (from WFM7209) with a head from Milicast (exact set unknown). I didn't pay too much attention to painting it, as it would be almost completely hidden in the end. One of levers in the driver's compartment was one of the parts that were lost in the mist of time. It was subsequently replaced by a scratchbuilt item. 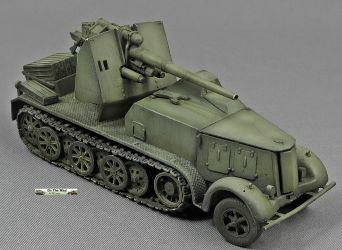 When adding the armored cab over the driver's compartment, I first thought that its front edge should be flush with the armor on the engine deck. After quite some sanding and filling, I discovered that there is actually a distinct step, which meant more filling and sending to undo my previous work and make it look like it should. Obviously, this meant that all the detail that was present on this part was lost and had to be rebuilt from scratch. Note that the armor on the tip of the nose (protecting the cooling grill) stood proud of the nose. Due to casting limitations, the area between nose and add-on armor is solid in the kit. The gun assembly was rather straightforward, except from a slightly warped gun barrel (which was corrected in hot water) and a misalignment of the rectangular plates on top of the gun barrel (which was corrected by sanding). I decided to add a crew that came from the Zvezda Flak 36/37 kit, which fortunately wear early war tunics. I used all four of the figures, even though  states that the total crew of the vehicle was four (including the driver). 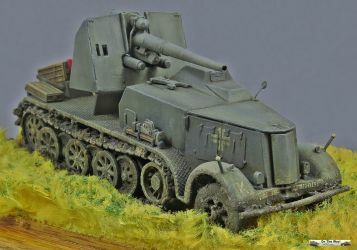 Using this crew meant that a few rearrangements needed to be made to properly install the gunner, which is sculpted in an operational position. While the figures are very convincing, they also need a fair amount of reconstruction where the mold halves meet. As the plastic is easy to work with, and the lost detail mostly straightforward, a steady hand and a new scalpel are all that is needed. The figures don't need glue, but I assume most modelers will use glue regardless. In that case I would recommend reducing the locating pins to a mere stump, to get a better joint (and to use MEK or similar glues). Note that the recommended maximum traverse of the gun was 5° to either side for reasons of stability. 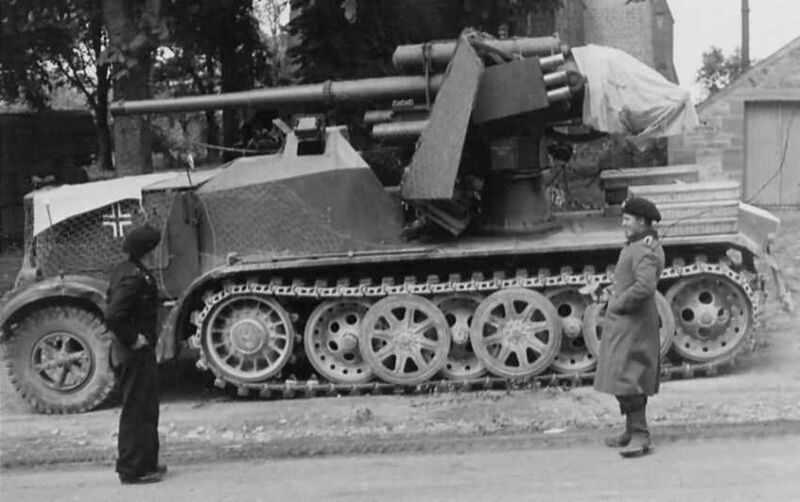 It would also have been very difficult for the crew to access the gun if it was traversed more. Both the equilibrators' position and needle indicator in the kit correspond to a low elevation (cf. Al Magnus' article), which is the position this gun was meant to be used in. 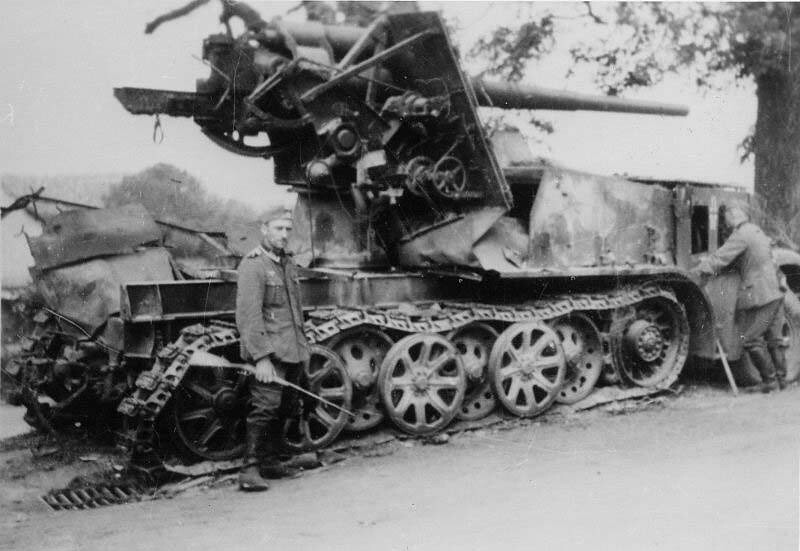 The guns on these vehicles underwent a modification that combined the traverse and elevation wheel in a double wheel that could be handled by one person (the gunner). 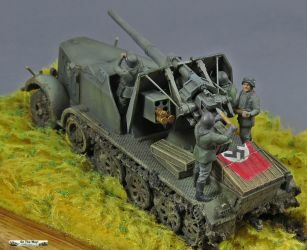 While the kit provides the chain link, connecting one of the wheels to the mechanism at the rear of the gun, only one wheel is present. 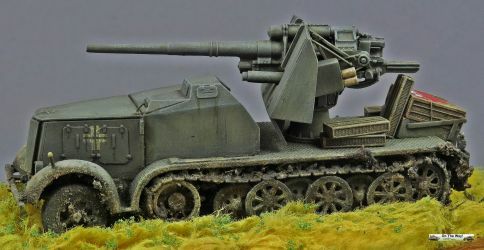 Fortunately, the gunner from the Zvezda kit holds a wheel in his hands, providing the second, missing wheel. (Incidentally, the GB Modelli website has pictures of the double handhweel.) I scratchbuilt a new seat for the gunner to get a more realistic "sit". 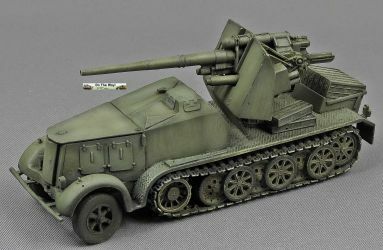 Not mentioned in the instructions, but shown in the accompanying pictures (which are available on the GB Modelli website in color and better resolution), is the need to add some scratchbuilt reinforcing rods for the gun shield and the need to open up the view ports in the shield. There were two rather substantial air bubbles in the gun shield that required some attention, but nothing dramatic as they were situated in a harmless spot. To the left of the gun is a ready-ammo box. I placed a few rounds from the spares box in a few of the holes, and drilled out the remaining holes. (Pictures of the real thing can be found here, here or here.). While the rounds in the hands of the Zvezda figures are underscale, I found it not worthwhile to replace them. Unfortunately, I realized too late that the rounds I had used in the read-ammo box were chosen to be the correct calibre, and the difference in size instantly becomes obvious when you pay attention to it. The instructions tell you to add turn indicators to the side of the nose armor and small headlights to the top of the fenders. Bots were missing in my set, either because they got lost during their long stay on the shelf, or because I had already lost them from the start. As they don't seem to be present in the scan in the preview, I assume they chose freedom a long time ago. The same story can probably be applied to the rearview mirror. 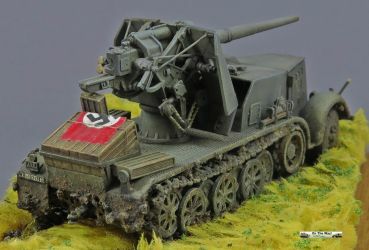 All these items were easily replaced with scratchbuilt items however. Width indicators are not mentioned, but indentations for their location are present. These eventually came from the spare's box. 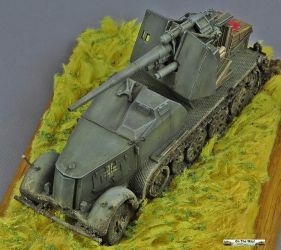 The main headlights in the kit are of the most common type, but modelers should note that round types can be found in wartime pictures. The rear lights that are given in the kit are of a different type as that seen in pictures. Perhaps I should have replaced them, but I didn't. What I did do, was to add a licence plate to the left rear fender. This came from Extratech. 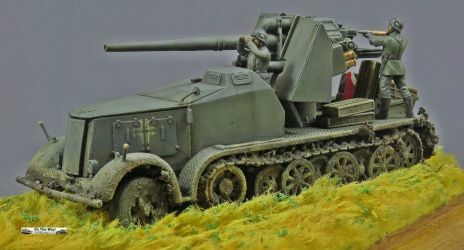 I had some trouble figuring out where the four ammo boxes at the rear of the vehicle had to go, but images in my references and on the Briga (GB Modelli) website helped to sort this out. Apparently they are just placed at the discretion of the crew. As I was going to add a crew to handle the gun, I decided to leave the boxes off until the end, to make sure they didn't interfere with the crew. As the crew is carrying ammo pouches for rifle rounds, I should probably have stowed a few Kar98k's somewhere on the vehicle, but failed to do so. As the vehicle carried three identical rectangular licence plates, I needed to find these in my spares box. 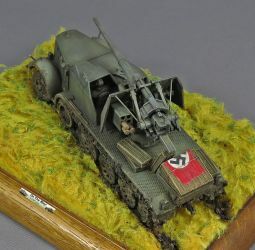 Fortunately I have built enough of ICM's Sd.Kfz.222/223 series which come with an overload of spare decals so that I could get one licence plate of each of three of the decal sheets that were found in the spares box. The figures were painted in a mix of 1940 and 1941 uniforms. The flag came from a Unicorn set. Die Halbkettenfahrzeuge des deutschen Heeres, Band 6 der Reihe Militärfahrzeuge; W.J. Spielberger.